With only four NFL teams still standing CBS Sports is busily preparing to blow the lid off the Mercedez-Benz Stadium in Atlanta at the 3 February decider. The Eye Network, hosting its 20th Super Bowl in 2019, is poised to move the chains of technological innovation with the use of augmented reality on wireless handheld cameras, an army of 8K and 4K cameras, and much more. Most fans are intrigued by the action or by the commercials during timeouts, but those at home are in for a treat. With a past filled with notable creativity — including several firsts: an NFL Championship in colour (1966), use of telestration (1982), and PylonCams (2016) — CBS will impress tech enthusiasts with a new fleet of production achievements. The reality will match the network’s boast. The 115 cameras deployed throughout the stadium to capture every large and small detail will include 16 4K cameras – nine of which will be Sony HDC-4800’s capable of 8X slo-mo — and multiple 8K cameras. For the first time on any network’s live coverage of a sports event, CBS Sports will deploy wireless handheld cameras showing live AR graphics and use up-close camera tracking on the field. Four cameras (including the SkyCam) will have live augmented-reality graphics, and an additional 10 cameras will feature trackable–first-down-line technology, bringing the number of cameras with AR graphics to 14. In another first for any US network, CBS will use multiple 8K cameras to deliver close-up views of the action from the end zone, including possibly game-changing plays along the goal lines and end lines. As if these firsts were not enough, CBS will combine old and new techniques in both end zones. Among the more than 50 cameras (25 for each end zone) will be multiple 8K cameras, six 4K cameras, three goal-post super-slo-mo cameras shooting the backlines, and 14 cameras embedded in pylons on each side of the field. The last game of the NFL season has always been reserved for mainstream television, but CBS is extending the broadcast to all OTT platforms as it did for Super Bowl XLVII in 2013 and Super Bowl 50 in 2016. Streaming will be available online at CBSSports.com and through the app for connected-TV devices, tablets, and mobile phones, as well as via the CBS All Access subscription service. Along with new ways to stream the game on-the-go, CBS Sports HQ is setting the stage with exclusive content. For a full list of programming leading up to the game, click HERE. “These are all new ways for us to reach our audience anywhere, anytime,” Ianniello said. Inside the truck, the dynamic duo of lead producer Jim Rickhoff, in his inaugural Super Bowl, and four-time lead director Mike Arnold will control the production. In the booth, Jim Nantz and Tony Romo will be paired for their first Super Bowl call together, and Gene Steratore will provide rules analysis. Tracy Wolfson and Evan Washburn will command the sidelines as reporters, along with Jay Feely. Prior to the game, CBS will keep fans entertained for up to seven hours before kickoff. The fun starts with That Other Pregame Show at 11:30 a.m. ET, NFL Films’ Road to the Super Bowl at noon, and the 1:00 p.m. premiere of Romo’s behind-the-scenes journey to Atlanta in Tony Goes to the Super Bowl. From 2:00 to 6:00 p.m., The NFL Today’s James Brown, Boomer Esiason, Bill Cowher, Phil Simms, and Nate Burleson will join Ian Eagle for the show’s four-hour Super Bowl edition. 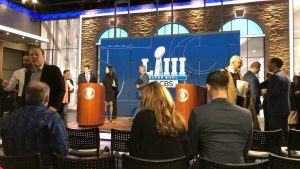 With a packed schedule of coverage before, during, and after the game, viewers will have a lot of things grabbing their attention, but McManus urges spectators to be ready for anything and everything, especially from a production standpoint.